Following the first-quarter, the growing demand for light trucks over cars will continue to be noticeable, but this will likely be more of a quandary for creditors rather than dealers, says National Automobile Dealers Association chief economist Steven Szakaly. “The falloff in those sedan prices and then the returns of those leases are much more of an issue for finance companies than they are actually for the retail body,” Szakaly said during a media conference call on Wednesday where he and NADA chairman Mark Scarpelli shared insights on the overall economy following the first quarter. Sedans have lost about 12 percent market share so far this year, and trucks have gained a little above 7 percent, according to Szakaly. Szakaly predicts overall new-vehicle sales will total 17.1 million vehicles this year. Though the total number of U.S. jobs have seen an increase in recent weeks, wages themselves have remained stagnant and that has a significant impact on the used-car market in particular because consistently high wage earners tend to buy new, he explained. “Slightly on the negative side, we’ve got this lack of wage growth overall and that continues to be one of the fundamental troubling factors," Szakaly said. Despite a decrease in the purchase of sedans overall, customers who can afford their desire for small luxury vehicles are likely to make a purchase this year, according to a recent Jumpstart Automotive Media study that analyses consumers’ car shopping behavior, as well as what segments of vehicles are either gaining or losing traction. Sedans within luxury-vehicle segment sales grew 7 percent from 2015 to 2016, and shopper interest for midsize and full-size luxury sedans rose over 10 percent, according to the study. “As long as people are working they are going to be looking at buying new vehicles and used vehicles,” Szakaly said. CarMax closed its fiscal year by reporting on Thursday that its total unit sales climbed 13.4 percent during the fourth quarter and 8.3 percent for the 12-month span. According to its latest financial statement, CarMax retailed 176,017 units in Q4 and 671,294 units during the fiscal year that concluded on Feb. 28. Within the wholesale side of its business, CarMax’s auction division sold 91,143 units during the fourth quarter and 391,686 units in the fiscal year, representing year-over-year dips of 1.2 percent and 0.7 percent respectively. And in its segment that buys vehicle installment contracts, the company reported that CarMax Auto Finance (CAF) income declined 10.2 percent to $82.9 million in the fourth quarter. For the fiscal year, CAF income softened by 5.9 percent to $369.0 million. All told, CarMax reported that its net sales and operating revenues increased 9.3 percent to $4.05 billion in the fourth quarter. For the fiscal year, the company tabulated that its net sales and operating revenues increased 4.8 percent to $15.88 billion. In the fourth quarter, CarMax said its net earnings increased 8.2 percent to $152.6 million and net earnings per diluted share rose 14.1 percent to $0.81. The company explained year-over-year comparisons were affected by a previously disclosed impairment-related charge of $5.2 million, net of tax, or $0.03 per diluted share, which reduced the prior year’s fourth quarter results. For the fiscal year, the company added its net earnings increased 0.6 percent to $627.0 million and net earnings per diluted share rose 7.6 percent to $3.26. While CarMax noted that its total used-vehicle unit sales grew 13.4 percent in Q4, the company also pointed out that its comparable-store sales rose 8.7 percent year-over-year. “The comparable-store sales performance resulted from a strong increase in conversion, together with a modest increase in store traffic,” the company said. For the non-Tier 3 customer base — what CarMax considers to be its prime credit buyer segment — comparable store used unit sales rose 15.3 percent. “We continued to experience a headwind related to our third-party Tier 3 sales mix,” the company said about this segment that declined to 9.4 percent of used unit sales from 14.5 percent in the prior year’s fourth quarter. “Tier 3 sales represent those financed by our third-party finance providers to whom we pay a fee,” CarMax continued. “Credit tightening by our third-party Tier 3 finance providers earlier this year, a continued reduction in credit application volume from customers at the lower end of the credit spectrum and a delay in payments of federal income tax refunds in February, all contributed to the decline in Tier 3 mix,” CarMax went on to say. Touching on its wholesale activities, CarMax explained why Q4 unit sales softened by 1.2 percent year-over-year. CarMax also shared its gross profit per unit figures for both its retail and wholesale operations. On the retail side, the Q4 figure stayed “largely consistent,” according to CarMax, at $2,134 per unit versus $2,109 per unit in the prior-year period. On the wholesale side, the per-unit figure dropped by 7.8 percent year-over-year during the fourth quarter, settling at $938 compared to $1,005 a year ago. CarMax Auto Finance indicated its average managed receivables grew 11.5 percent to $10.54 billion. The total interest margin, which reflects the spread between interest and fees charged to consumers and its funding costs, declined to 5.7 percent of average managed receivables from 5.9 percent in last year’s fourth quarter. The company also mentioned the allowance for loan losses as a percentage of ending managed receivables was 1.16 percent as of Feb. 28, compared with 0.99 percent as of Feb. 29, 2016 and 1.10 percent as of Nov. 30 of last year. Four automakers posted new all-time highs for monthly certified pre-owned sales in March; a month where Autodata Corp. determined the industry turned the second-highest amount of CPO units ever. And perhaps the industry will need other OEMs to join that performance level in order to keep up with the volume of off-lease vehicles hitting the wholesale market. Autodata reported that four automakers — Fiat Chrysler, Kia, Maserati and Nissan — closed the first quarter with their highest CPO sales total ever for a single month. The firm indicated Fiat Chrysler turned 23,266 certified units as Nissan moved 18,509 CPO models. Kia recorded 7,513 certified sales as Maserati turned 79 CPO models. In fact, Autodata mentioned to Auto Remarketing that Fiat Chrysler’s CPO sales total compiled during the first quarter also set an all-time high for the OEM, as its franchised dealers retailed 58,398 units. All told, Autodata reported that dealers retailed 243,277 CPO units in March, off by just 0.3 percent year-over-year when the all-time sales record was established. That’s when the industry delivered 243,944 certified models. The March figure also soared past the CPO sales total recorded during the previous month by 15 percent. For the quarter, Autodata indicated the CPO sales figure came in at 647,373 units, edging 0.1 percent higher compared to the first quarter of last year. The amount also was 0.8 percent higher than the fourth quarter of 2016. Analysts pointed out that there were 27 selling days in March of this year and last year as compared to just 24 in February of this year. The March sales figure computed into a daily selling rate was 9,010, according to Autodata. Looking deeper at the March data on a year–over-year basis, analysts noticed that domestic brand share fell 1.8 percentage points to 35.4 percent, as European share increased 1.2 points to 16.3 percent. Autodata added the Asian share edged up 0.7 points to 48.3 percent. No matter which brand has share, Edmunds senior analyst Ivan Drury explained to Auto Remarketing that it appears OEMs and their dealers are going to have to keep this record or near-record setting pace in order to keep off-lease units from sitting in inventory for too long. “While we've seen a consistent rise in off-lease each year, it appears that CPO sales are not trending as closely with off-lease as once predicted,” Drury said. “This could be an indicator that we’ve begun to saturate the market. “CPO, on an overall level, is utilized as a way to distinguish and show differentiation from the rest of the used market, but as we have waves of relatively new vehicles of similar trim levels and mileage, it could be less of a selling point and just seen as added cost when there are so many comparables,” he continued. Kelley Blue Book managing editor Matt DeLorenzo also looked cautiously at the relationship between off-lease wholesale volume and CPO retail trends. “The glut of off-lease vehicles needs to be managed carefully because these are the units that provide most of the CPO inventory, thanks to annual mileage caps that make these vehicles more desirable and easier to warranty than high-mileage units,” DeLorenzo said. “These CPO units really don’t prime new-vehicle sales other than being able to flip the current lessee into a new vehicle. That used unit as a CPO becomes an entry-level vehicle to a buyer who may not be able to afford a new model of a particular brand. And as DeLorenzo mentioned, the incentive moves automakers are using to turn new models could leave a rippling impact over to the used department trying to retail CPO units. “There is no question that huge rebates will have an effect on the used-car market, and CPO vehicles will not be immune to those pressures,” DeLorenzo said. “That said, there’s more to the CPO proposition than just price. Some rebates may be on only the entry-level versions of a particular model or may be offered regionally. A buyer may still opt for a better equipped CPO car that could come in at or just under the price of an all-new car with less equipment. And that’s not to say that makers will be looking to re-lease their CPO cars at attractive rates (this is a small slice of the market, but it could grow) or offer other non-cash incentives and spiffs like extended warranties and subsidized financing to make the CPO deal compelling. Drury also touched on how consumers are weighing the option of purchasing a CPO unit versus a new model, especially one that might have a substantial amount of cash on the hood. “Consumers who shop both new and used/CPO vehicles are research-intense and tend to spend much greater amounts of time gathering information and searching inventory than those who strictly shop new or used,” Drury said. “Some of this stems from simply having more options, but for a consumer looking to get the best bang for their buck comparing used, CPO and new is vital. Analysts who compiled White Clarke Group’s United Kingdom Asset & Auto Finance Survey 2017 say that the U.K. finance market has been resilient in the face of historic changes in the past year, but challenges will remain in 2017 and beyond. “The first and most encouraging point to note is that the asset and auto finance market not only continued to grow in 2016, in spite of fears of what might happen in the aftermath of the vote to leave the EU and wider concerns about the global situation, it has carried on growing into 2017 and shows little sign yet of slowing,” White Clarke Group chief executive officer Brendan Gleeson said in the report. “Nonetheless, there are genuine concerns about the potential effects of Brexit, even though the Article 50 starting pistol has only just been fired and the UK won’t be exiting the EU until 2019,” he continued. The complete survey report can be downloaded here. Autodata Corp. determined the industry in March turned the second-highest amount of certified pre-owned vehicles ever. 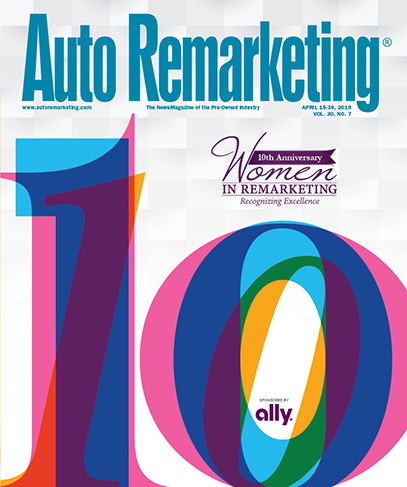 According to information shared with Auto Remarketing, dealers retailed 243,277 CPO units in March, off by just 0.3 percent year over year when the all-time sales record was established. That’s when the industry delivered 243,944 certified models. Editor’s note: Watch for upcoming reports from Auto Remarketing highlighting the new, recording-setting CPO sales figures certain automakers as well as industry reaction to how the certified market is behaving. While just 1.5 percent of car buyers resell their new cars within the first year of ownership, iSeeCars spotlighted 11 models thatn see at least twice the rate of resale when compared to average car, says the research firm. iSeeCars analyzed more than 24 million individual new car sales and counted how many of those new cars were reselling as used within the first year. Six of the 11 models are from BMW and Mercedes-Benz. The following is a list of the new cars resold most often as used within the first year of ownership, according to iSeeCars.com, along with percentage going this route. "While some might be surprised that these luxury brands top the list, these auto manufacturers offer their dealers incentives to buy new cars to use as loaner vehicles, which are then sold as used when they are still under a year old," Phong Ly, chief executive officer of iSeeCars.com said in a news release. "This is a marketing strategy with a two-fold purpose. It puts brand-new models in the hands of current owners when they bring their cars in for service, increasing the likelihood that they will buy another car from that brand. In addition, it essentially increases the brand's new car sales, which help to give them the ability to claim the title of 'top luxury brand', something that BMW and Mercedes-Benz compete for every year." iSeeCars suggests that one reason these models are being resold within the first year of ownership is linked to quality or perceived quality of the cars. Aside from the BMW and Mercedes-Benz models, the remaining models on the list, all ranked an average of three stars or less in the J.D. Power 2016 U.S. Initial Quality Study, which surveys consumers after 90 days of ownership, iSeeCars said. "It's not surprising that consumers would make a change after a short amount of time if they felt the quality was lacking," Ly said. "After all, a new car is a very expensive purchase and one that consumers spend a significant amount of time with multiple times a day." Additionally, the high resale rate of the 11 models represents an excellent opportunity to find bargains on them. Nine of the 11 models have an estimated discount 12.7 percent higher than the average car, according to iSeeCars.com. The following is a list of each model's average discount. iSeeCars analyzed more than 24 million individual new car sales of model years 2015-2017 within calendar years 2015 and 2016. The firm used each car's Vehicle Identification Number to see whether the car was re-listed between four months and a year of its sell date. New cars with over 500 miles and used cars with less than 4000 miles were excluded from the study. The amount of cars relisted as used was then articulated as a percentage of the number of new car sales by iSeeCars.com. A deeper look into the latest certified pre-owned vehicle sales information compiled by Autodata Corp. showed eight automakers that often generate some of the largest CPO volume are off to strong starts again in 2017. Of those eight OEMs, each one has posted year-to-date CPO sales gains of at least 8 percent. Leading the charge in terms of an increase in actual units is BMW, which has turned 21,462 certified units in two months, according to Autodata. That figure represents a 27.3-percent lift year-over-year. The single OEM with the highest CPO sales figure through the first two months of the year is Toyota. Autodata indicated the automaker turned 61,833 certified units in January and February. Besides Honda and Nissan, the other two automakers to move at least 30,000 CPO units during the first two months of 2017 were Ford/Mercury (32,882) and Chevrolet (38,045). While industry observers spotted some factors impacting new-car sales, franchised dealerships produced strong results in moving certified pre-owned vehicles as the industry generated nearly a double-digit gain on a sequential basis. According to information supplied by Autodata Corp. on Wednesday, February’s CPO sales came in at 211,475 units; a figure relatively unchanged from the same month last year but it represented a 9.8-percent jump from January. Autodata said year-to-date sales through February now sit at 404,076 units, marking a 0.4-percent lift versus the same juncture a year ago. Analysts pointed out there were 24 selling days in February of this year and last year as well as January. That element meant the daily selling rate was 8,811. Looking a little deeper into the figures, Autodata determined year–over-year domestic CPO brand share softened by 2.9 percentage points to 33.8 percent. Meanwhile, European share ticked up 0.6 percentage points to 16.9 percent. The Asian share also increased, rising by 2.3 percentage points to 49.3 percent. Perhaps what helped to goose CPO sales in February was shopper traffic dealerships generated through their websites, especially potential buyers scanning inventory via a mobile device. Dealer.com, a Cox Automotive company based in Burlington, Vt., that runs 62 percent of the nation’s dealer websites, shared some insights this week. “Overall traffic on our Dealer.com websites was strong in February — at a good level — although the level is roughly flat versus year ago,” Andy MacLeay, director of digital marketing at Dealer.com. Editor’s note: Watch for an upcoming report from Auto Remarketing detailing the February CPO sales figures from of the leading automakers in the space. Industry observers see trends in the new-vehicle space that are making the delivery of new metal more challenging and, as a result, likely to impact how efficiently dealerships can turn their used-vehicle inventory. Analysts from Autotrader, Edmunds and Kelley Blue Book all shared data and insights with Auto Remarketing on Wednesday that pointed to possible challenges for franchised dealerships that might face the challenge of finding buyers for their new models — which in some cases are taking the amount of days to turn not seen in almost eight years. Meanwhile, off-lease volume continues to grow with units ripe to be retailed as certified pre-owned is on the rise. “(New-vehicle) inventory is starting to swell, which is concerning considering that we’re still months away from the peak summer selling season,” Edmunds executive director of industry analysis Jessica Caldwell said in a message to Auto Remarketing. • Subcompact cars had a days to turn of 102 days. • Large cars had a days to turn of 86 days. • Midsize cars had a days to turn of 82 days. • Industry average was 74 days. “The automakers are in a tricky spot: aggressive incentives are already starting to eat into profits and residuals, but it takes discipline to pull back the production reins in what’s still a fairly strong market,” she said. And what about the CPO department? “The used vehicles that will feel the squeeze are off-lease and otherwise near-new used,” Caldwell said. “We know those particular types of inventories will climb due to high lease rates so having an abundance of new inventory will create more pricing pressure for those vehicles. The older used vehicles have short supply with higher demand so those should not feel the squeeze from climbing new-car inventories." Kelley Blue Book senior analyst Alec Gutierrez acknowledged during a conference call on Wednesday that “we are seeing inventory build up across the spectrum” as he put new-vehicle days’ supply at close to 80 days, up from about 70 days a year ago. Gutierrez indicated automakers are slapping more than $3,500 on the hood in incentives to get new models rolling over the curb; a trend a bit surprising since February typically is a slow month for new-car sales anyway. “You see where inventory levels are at and I think manufacturers are making a concerted effort to try to get the numbers down to some extent,” Gutierrez said. “You would think in February with the expectations and with respect to seasonality, we all know this is a slow month. This would be a month where you could expect to pull back on incentives a bit and a little bit of reduced performance, and it wouldn’t really break anyone’s expectations. “But I think at the end of the day, consumers have seen rising incentive levels,” he continued. “We know that typical consumers are going to be in the marketplace typically for 60 to 90 days if not more ahead of their purchase. If they’re keeping tabs on incentive activity and trying to time their overall decision of when to head to the dealership to finalize the deal, a sudden cutback in incentives could certainly sway that to wait or seek an alternative. “To some extent, incentives remain high because they have been high. Until we see a meaningful impact on overall inventory levels and days’ supply, it’s going to be a slow ramp back down with incentives. And at this point, we’re still seeing the trend head upward,” Gutierrez went on to say. So if incentives are going to stay high, what’s that trend going to do to dealerships’ used-vehicle prospects? “With days’ supply where it is and the incentive load at $3,600-plus per unit, there’s most definitely going to be a trickle-down effect impacting the used-car side,” Guiterrez said. “In fact, when we look at overall performance of late-model inventory at auctions across the U.S., we’re seeing about a 2 percent reduction in terms of what dealers are willing to pay at auction year-over-year. If you look at it in terms of retained value, the auction value as a percent of vehicle’s original MSRP, you’re seeing more like a 3-point reduction. During Wednesday’s conference call, Autotrader senior analyst Michelle Krebs pointed out that there were “healthy” shopping activity on dealership websites last month. She also mentioned the latest analysis from the Conference Board placed consumer confidence at the highest level since 2011 with a strong sentiment of people likely to make a vehicle purchase. But should it be a new model or a certified unit? “From a consumer point of view, it’s going to take a little bit more studying to which is the better deal, the off-lease vehicle and sold as a certified pre-owned versus a new one that’s heavily incentivized,” Krebs said. While there might be a glut of new-vehicle inventory gumming up the system now, Krebs advised that the industry keep watch of what happens as the first quarter unfolds. The first two publicly traded groups to share their 2016 financial statements — AutoNation and Group 1 Automotive — posted mixed results within their used-vehicle departments. Group 1 reported that its dealerships retailed 129,131 used vehicles last year, representing a 4.0-percent increase above the 2015 figure. The company also generated a 3.3-percent rise in retail used-vehicle gross profit as its revenue in the used-car space climbed 6.7 percent. For the year on a per unit basis, Group 1 reported retail gross of $1,472 on its used-vehicle turns. That figure softened by 1.7 percent year-over-year. Meanwhile, the F&I offices at Group 1 stores compiled a $74 increase in gross per unit, ending the year at $1,599. At AutoNation, the dealer group said it turned 225,713 used vehicles in 2016, which ended up being a figure 1,577 units less than the previous year. And the group’s gross profit per used unit softened by $93 to settle at $1,484 for the year. But like Group 1, AutoNation made improvement in the F&I office as gross per unit on the back-end of deliveries jumped by $54 year-over-year to finish 2016 at $1,588. Both Asbury Automotive Group and Penske Automotive Group are scheduled to release their year-end results on Tuesday. Later this month, both Lithia Motors and Sonic Automotive will share their numbers, too, on Feb. 15 and Feb. 21, respectively. If he joins Asbury’s conference call with the investment community, it likely will be the last time for Keith Style, who recently provided notice of his intention to resign from the position of senior vice president and chief financial officer of the company effective March 7. Asbury indicated Style is departing in order to accept the position of president and chief financial officer of a privately owned company. “I would like to thank Craig for his mentorship during our time working together,” Style said. “I’m very thankful for the opportunities and support both he and the Board provided me during my years at Asbury. It's been a privilege to work alongside the high-performing members of the Asbury team. Asbury also announced that William Stax, corporate controller and chief accounting officer of the company, was appointed interim principal financial officer effective March 8 while the dealer group conducts a search for a new chief financial officer.